The recent work of a group of researchers at the Faculty of Medicine and the Children’s Hospital of Eastern Ontario (CHEO) has brought science closer to understanding the pathogenesis of inflammatory bowel disease (IBD) in pediatric patients. In a paper published recently in Nature Communications, the team reported functional changes of the microbial community (microbiome) that inhabit the gut of children with IBD. They also reported that these changes are accompanied by alterations in human proteins related to anti-microbial defense. Their observations suggest a role for gut-secreted particles (extracellular vesicles) in IBD pathogenesis by transporting these antimicrobial human proteins to the microbial community. The group of researchers was co-led by Dr. Daniel Figeys, professor and chair of the Department of Biochemistry, Microbiology and Immunology (BMI), Dr. Alain Stintzi, also a professor in BMI, and Dr. David Mack, professor of pediatrics; Xu Zhang and Shelley Deeke are co-first authors of this work. An individual’s intestinal tract naturally interacts with its microbiome. These complex interactions, when altered, play a key role in the pathogenesis of inflammatory bowel disease. Just why a disruption causes disease is not entirely known, but the study by Figeys et al brings new clarity to this mystery of the gut. To help explain why disease develops, the researchers studied new-onset pediatric IBD patients to detect alternations in the proteins of the microorganisms as well as the patient’s own proteins. They also looked at the characteristics of the host’s proteins that cause stress in the gut and thus to the microbiome. Their discoveries provide valuable insight into the interaction between host and microbiome. The researchers are hopeful that the findings in this study may shed light on the future development of new diagnostic biomarkers and microbiome-targeted therapeutic approaches for both young and adult IBD patients. “The approach used in this study also provides a framework which can be applied to investigate the roles of microbiome in a variety of other diseases, such as obesity, diabetes and cardiovascular diseases, which are considered as being associated with an imbalance in the gut microbiota,” says Dr. Zhang. Main photo credit: Image showing patterns of microbial gene expression in the gut of pediatric IBD and non-IBD patients. Courtesy the Daniel Figeys lab. The authors of the paper in Nature Communications. 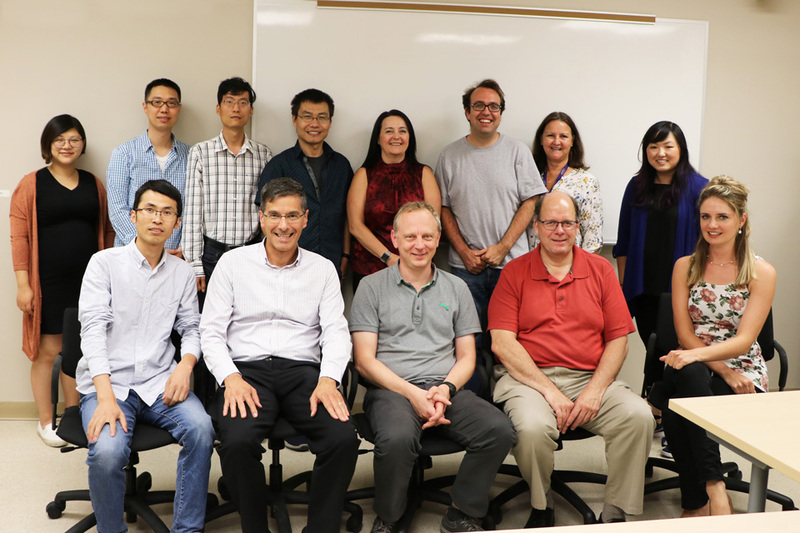 First row (l-r): Xu Zhang (first author), Daniel Figeys, Alain Stintzi, David Mack, Shelley A. Deeke (first author); second row (l-r): Leyuan Li, Bo Liao, Kai Cheng, Zhibin Ning, Janice Mayne, James Butcher, Ruth Singleton, Jennifer Li. Absent: Amanda E. Starr. Photo courtesy of the Daniel Figeys lab.